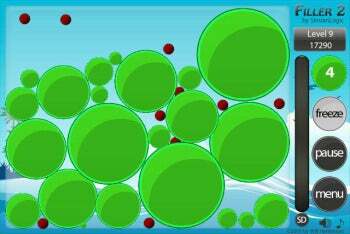 Filler 2 is a Flash game in which you have to fill up the screen with balls while avoiding small circles that bounce around chaotically. It sounds simple, because it is. But it's also lots of fun, and on the lowest difficulty setting, it can even be soothing. Then again, if you are looking for a challenge, later levels on the Hard setting verge on frustrating. In Filler 2, you can use the balls you inflate to trap and contain the circles that bounce around the screen, so they stop interfering. To start inflating a new Filler 2 ball, click anywhere on the screen and hold the mouse button down. As long as you're holding, your ball will keep inflating. If it bumps up against a wall or another ball you've previously inflated, it will stop. If it bumps up against one of the tiny evil circles bouncing around the screen, it will pop and you will lose it (on the Normal and Hard difficulty settings), or will just stop growing (on the Easy setting). While the ball is inflating, you can move your mouse around to reposition it and avoid obstacles. Naturally, you don't have an unlimited supply of balls: Filler 2 starts you off with ten balls on the first level, and with every level you pass, you get more. When I played on the Easy setting, I got up to level 17 and had over 25 balls at the beginning of the level. This is useful, because it means you can inflate lots of little balls rather than have to make a few large balls, somehow avoiding the evil bouncy circles. As you fill the screen with balls, a vertical progress bar on the right side of the screen fills up. Once the bar is full, you pass. If you run out of balls before the bar is full, it's game over: You don't get to restart the level, but must start fresh from level 1 if you want to have another go. On the first level of Filler 2, you have just two bouncy circles to contend with, so they're pretty easy to avoid while inflating balls. But each new level has more and more bouncy circles, gradually escalating into a frenzy of tiny circles that will inevitably hit the ball you are inflating sooner rather than later. On the Easy and Normal difficulty settings, there's a helpful trick: You can freeze time. Hit the spacebar, and all motion on the screen stops. You can keep inflating your ball, and even move it around, but the bouncy circles no longer bounce, at least until you finish inflating your ball. You can't repeat this trick many times, however: Each level you successfully pass gives you just a fraction of time you can freeze, so you might want to save up. Filler 2 is a simple game, but it is also satisfying. There are no timers or in-game ads, and the sound can be muted, so you can keep the game running in a background tab and come back to it whenever you have a moment. I recommend the Easy setting for a relaxing, ambient experience. Note: The Download button takes you to the vendor's site, where you can play this game in a Flash-enabled Web browser. Click to fill the screen with orbs--be careful not to touch the moving black circles.